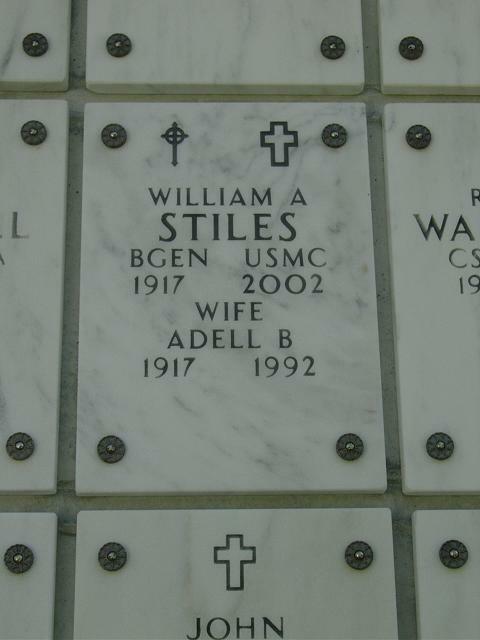 William A. Stiles was commissioned a Second Lieutenant in the U.S. Marine Corps June 1, 1939, on graduation from the U.S. Naval Academy, and was ordered directly to Basic School in Philadelphia, PA. On completion of TBS in 1940, he spent the mid-year season with the USMC Rifle & Pistol Team, attaining Distinguished Marksman status and firing as a team member on the 1940 USMC National Championship Rifle Team. Returning to Quantico from Camp Perry, he joined the 1st Marine Brigade, FMF and spent the following winter with E-2-5 on Caribbean maneuvers during that formation period of the 1st Marine Division prior to World War II. At newly opened Camp Lejeune later that year, he was assigned the command of the Assault Engineer Company, 1st Engineers, which unit he led on D-day at the assault of Guadalcanal August 7, 1942. His "D" Company saw action in the defensive line at the critical September 13th battle for "Edson's Ridge". 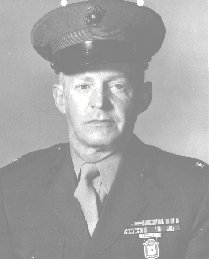 During the later Cape Gloucester campaign, Major Stiles served as S-4 of the 17th Marines (Engineer), a newly formed regiment of 1st MarDiv. On return to the US in 1944, he was assigned to the M-5 Division of Plans and Policies, HQMC, serving in the Infantry Branch there until the end of WWII. In 1946, he attended the first post-war course at the Senior School at Quantico, VA. Back to the Pacific in 1947. He was assigned for 2 years as Force Marine Officer on the staff of Commander, Battleship-Cruiser Force. His next assignment ~after those two years of sea duty again was at Quantico, where he was stabilized for 3 years as an instructor in the Combined Arms Section of the MCS Education Center. In 1952, LtCol Stiles was ordered to 2d Marine Division, where he served as CO, 2d Battalion, 2d Marines, and later as 2d Marines Executive Officer. That FMF duty was followed by 2 years in the Plans Division of CinCLantFlt Staff at Norfolk, and a subsequent assignment to the= 1957-8 Class of the Industrial College of the Armed Forces. On graduation from ICAF, Col. Stiles served with the newly formed J-5 Division, Joint Staff, JCS until ordered back to FMF duty overseas in 1960. At Okinawa, he joined the 3d MarDiv and was assigned command of the 9th Marines, which duty he held until leaving Okinawa in 1961. Returning to HQMC in 1961 for a second tour, he served as Head of the G-3 (Plans)Branch, then the principal planning support group for the CMC and Operations Deputy in the JCS arena. From this assignment, he was selected in 1964 for Brigadier General, soon thereafter being shifted to the Pentagon as OP-09M. In 1965, BGen. Stiles again joined the 1st MarDiv, at Camp Pendleton, but this time as ADC. Early the next year, he deployed to ChuLai, RVN, with the 5th Marines and the remaining rear echelon of the Division. At ChuLai, he formed within the Division a tactical ADC group designated Task Force XRAY, capable of separate combat action. When 1st MarDiv Headquarters shifted to Danang in the fall of 1966, BGen. Stiles remained at ChuLai as CG, Task Force XRAY, thereafter conducting or coordinating Divisional tactical operations in southern III MAF area until his tour was completed in March 1967. For these latter actions, he was awarded the Navy Distinguished Service Medal and several RVN combat decorations. On his return to the US, he assumed duties of CG, Landing Force Training Command at Little Creek, VA. While there, he also acted under US Navy orders designating him Commander Amphibious Training Command, Atlantic Fleet (a Rear Admiral's billet which he filled for much of his tour there). From this LFTCLant assignment, BGen. Stiles joined the retired list on May 1, 1968. Following his retirement, BGen. Stiles assumed the position of Eastern Regional Manager/Senior VP of Oppenheimer Industries, which was an agricultural management firm owned by BGen. H.L. Oppenheimer, USMCR. Settling in McLean, VA, he acted as NRA Referee for local and regional marksmanship competition, and also served on several local Boards including that of the Army Navy Club of Washington, DC. William A. Stiles, 84, a retired Brigadier General in the Marine Corps who served in two wars and held several high command and staff positions in Washington and elsewhere, died January 18, 2002, at the Arleigh Burke Pavilion at Carl Vinson Hall in McLean, Virginia. His death was attributed to complications resulting from strokes and cancer. In 1942, General Stiles, by then a Captain, went to the Pacific with the 1st Marine Division. He took part in the campaigns for Guadalcanal, an epic in the annals of the Marine Corps, and for New Britain. In 1944, he was transferred to Marine Corps headquarters in Washington. In the decade after World War II, General Stiles served in China, on sea duty with the Pacific fleet and at the Marine Corps Schools in Quantico as an instructor. He also commanded the 2nd Marine Regiment at Camp Lejeune. In 1955, he was named the amphibious plans officer for the Atlantic Fleet. He later graduated from the Industrial College of the Armed Forces and received a master's degree in business administration from George Washington University. In 1960, he went to Okinawa as a staff officer with the 3rd Marine Division and then as commanding officer of the 9th Marine Regiment. In 1965, after four years at Marine Corps headquarters, General Stiles returned to the 1st Marine Division as assistant division commander and served with it in Vietnam in 1966 and 1967. For part of that time, he commanded Task Force X-Ray, a multi-regimental tactical force. For that service, he was awarded the Distinguished Service Medal. General Stiles's final assignment before he retired from the Marine Corps in 1968 was as commanding general of the Landing Force Training Command of the Atlantic Fleet and of the amphibious training center at Little Creek, Virginia. In addition to the Distinguished Service Medal, his personal decorations included the Legion of Merit. From 1968 until he retired a second time in 1986, he was vice president and eastern regional manager of Oppenheimer Industries, an investment company based in Kansas City, Missouri, General Stiles had maintained a residence in McLean since 1959. His wife, the former Adell Jane Bury, whom he married in 1941, died in 1992. Survivors include three children, Susan Jane Rountree of Falls Church, Hunter Adams Stiles of McLean and William A. Stiles Jr. of Norfolk; two sisters, Rowena Anderson of Kansas City and Ruth Brady of Fredericksburg, Texas; and one grandson. survived by Ann N. Myers, other family and friends. Memorial service will be held Wednesday, January 30, 2002 at 1:30 p.m. in the auditorium at Vinson Hall, 6251 Old Dominion Dr., McLean, Virginia. Interment will be held on Monday, February 25, 2002 at Arlington National Cemetery. Memorial contributions in lieu of flowers may be made to the Navy Marine Corps and Coast Guard Residents Foundation at 6251 Old Dominion Drive, McLean, Virginia 22101.